Nearly done with Cleopatra now but just thought I would show some pictures of her as a child. 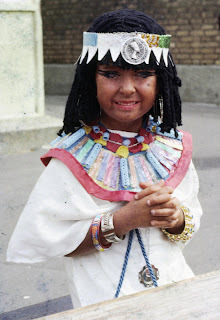 Ha, its me winning first prize at my school fancy dress, aged about five I think. I'd not seen these apart from on one inch square slides till last week when I had them digitised - very strange. Just trying out another drawing method, chalk pencil held at the very end on black paper - its a good way of stopping the tightness but I think I am making Cleo uglier every time I do her! Tried it out on a vintage reference photo - corny or what? I like squiggling though.